Our cultural heritage is a wellspring that everyone can draw from, build on, add to, and develop for future generations. 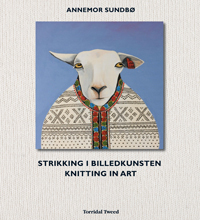 This book shows how artworks can be used to discuss knitting history even if the artists didn’t have that in mind when they painted. Often people dressed in knitted clothing were depicted so precisely that the knitting can be copied stitch by stitch. Artworks also contain invisible lead threads tied to stories about knitting not immediately apparent in the pictures. The yarns and techniques found in old knitted remnants have been the springboard for Annemor Sundbø’s updated designs for knitters and anyone interested in cultural heritag. and knitted garments from artworks.